I’m lucky to be married to someone special that comes from Bakersfield, CA. This apparently is a test market for Taco Bell. 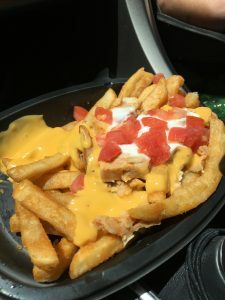 I’m not sure why this particular area is so lucky to experience Taco Bell’s newest creations, but I was able to try their Nacho Fries. I suppose Taco Bell feels the population represents their target market. There are certainly great food joints there like Tacos Las Salsas (10818 Rosedale Hwy) as well the usual variety of fast food places . Anyone who lives in an area with lots of Mexican food like Los Angeles, knows that asada fries are a thing. If you don’t like fries, it’s probably because you are very conscious about your health. For those of us that do indulge in such comfort foods, the option of extra hearty fixings on your french fries are the hallmark of fine dining. 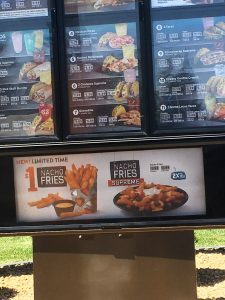 Throughout recent years, Taco Bell has embraced its growing image of experimenting with by offering some of the strangest creations most teens and munchie-craving stoners could possibly imagine in their wildest dreams. 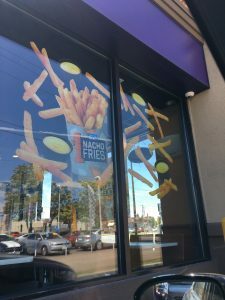 Though long overdue, Nacho fries seem pretty tame compared to such items as the crunchwrap and Doritos tacos. So how does this highly anticipated, new item taste? It’s just what you’d expect. The cheese is their nacho cheese. It’s pumped out of some dispenser and not produced by melting actual shredded cheese. The fries are battered, an unnecessary step Taco Bell chose to make this snack even heavier than it needed to be. I asked for chicken since I’ve been eating less beef and it tastes just fine. I think my fries could have been better with a touch of green onions and perhaps heat from some hot sauce. Should Taco Bell release this item nationally? Absolutely yes. They should also make it a permanent item. If you’re in the area, I went to the location at 2300 H St, Bakersfield, CA 93301. This entry was posted in Off-Topic on June 1, 2017 by Mark Azali.